Uber Partners with Denver Transit — What Could Go Wrong? These screen shots show how RTD rides will be integrated into the Uber app. Image: RTD. There’s no other way to say it: I hate the Regional Transportation District’s mobile app. Which is why it’s exciting — and troubling — that RTD partnered with Uber to allow riders to plan trips and buy tickets from within the ride-sharing company’s app. 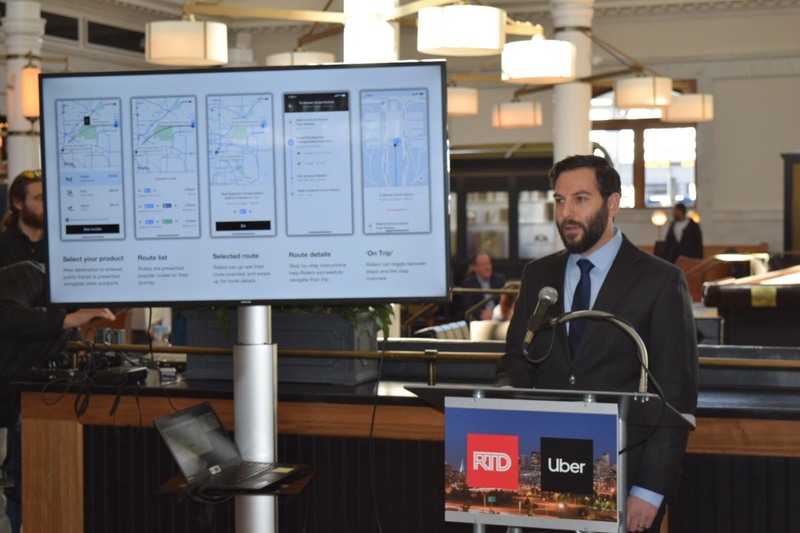 In the coming weeks, you’ll be able plug an address into the Uber app will see RTD bus and rail options up alongside suggestions for different Uber services, the two organizations announced today. In a first for Uber, customers will eventually be able to purchase RTD tickets within their app, too. David Reich, Uber’s Head of Transit announcing the company’s collaboration with RTD. Photo: RTD. The idea of entering a destination into a single app and choosing from multiple mobility options, including transit, bikes, scooters and ride sharing services, could be an important tool in reducing Denver’s overwhelming dependence on cars. But it could be dangerous to leave this in the hands of a company that has previously been hostile to cities as they sought data from the company and attempted to create common sense regulations that would help manage traffic. The announcement also comes as many people are growing concerned about how tech companies use their location data. And all of this raises other questions, like why would RTD partner with a company that will show you, in real time, how much faster you would get to work by clicking the ‘send to Uber’ button versus pushing the ‘tell me about my lame bus options’ button. A collage of screen shots from my frustrating experience buying a ticket with RTD’s app today. Image: Andy Bosselman, Streetsblog. And then there’s RTD’s app. After I saw the announcement this morning, I immediately opened up the RTD Mobile Tickets app — and then suffered a 10-minute fight with a clunky interface as I tried to buy a ticket. Although I’ve used the RTD app without a problem in the past, that wasn’t the case today. It repeatedly confused me while forcing me to navigate an uncountable number of steps and screens. Nearly every push of a button was an uncertain guess. Unable to login, I attempted multiple password resets. After all of that, I wanted to throw the phone across the room. I had the sense to give up and close the app instead. When I came back later, it was ready to sell me a ticket. 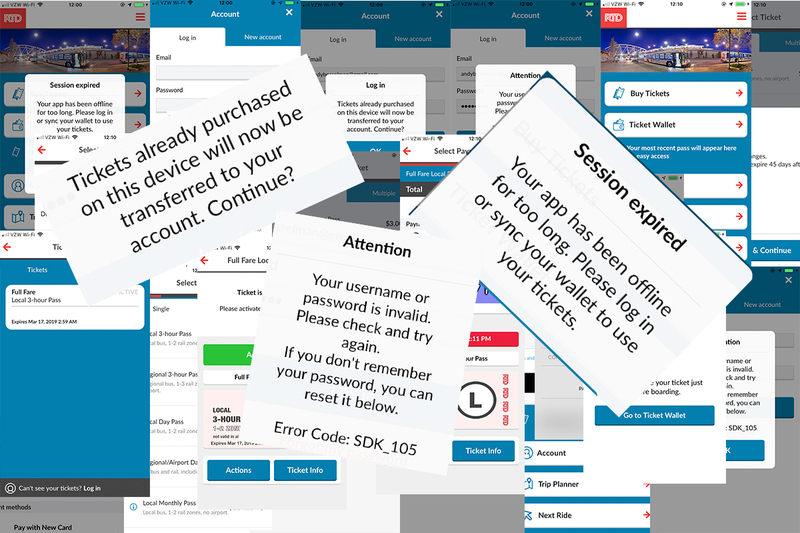 It turns out, an account and password aren’t needed at all to buy a ticket. But getting one still required me to navigate a confusing set of steps and error messages. On top of this user experience nightmare, everything about the RTD app is ugly. RTD isn’t alone in designing a barely functional mobile app. Even in San Francisco, the nation’s tech capital, the Muni Mobile app is just as ugly and only slightly more functional. RTD says it has sold 2 million tickets via its app since it launched in 2017. That goes toward the roughly 200 million trips the agency has handled in about the same amount of time. An animation of how the Uber app will display RTD trip options. Image: RTD. Compare one of these sloppy, publicly-funded apps to the friendly, easy-to-use user experience design found in the Uber, Lyft and scooter apps. Offering multiple mobility options inside a single app isn’t a new idea. MaaS Global, a Finnish company, works with transit systems to offer a slick app that helps people plan trips that include options like biking, public transit, and private services like car sharing. Unlike RTD’s deal with Uber, these Mobility as a Service, or MaaS, apps allow transit operators to give riders options beyond buses and trains — without supporting the interests of a ride-sharing company. In fact, Uber isn’t known for playing nice. It has a history of bullying and menacing city and state governments while forcing users to accept questionable policies surrounding how the company uses their location data. And many riders have already abandoned RTD as Uber became more popular: Last year 7.3 million fewer rides happened on RTD compared to 2014. But there is a bright side. Many regular Uber users may habitually open the app when they need to go someplace. If they start to see that public transit can get them where they want to go just as fast as an Uber ride, maybe this collaboration will shift some of those people out of cars and onto transit. Before I get too optimistic: I wonder how often transit will be better than Uber? I envision seeing Twitter aflutter with screenshots showing how RTD trips compare to Uber. I imagine a clever hashtag, where riders share examples of how a $6 Uber ride might be twice as fast as a $3 RTD ride. But maybe that, too, is a good thing. It could be a backdoor way to get RTD to do a better job before losing even more riders to Uber. To learn more about the Uber and RTD collaboration, visit this RTD website. Correction: This story has been edited to reflect that the RTD Mobile Ticket app launched in 2017, not 2014, and the number of passenger boardings since that time is roughly 200 million. Get Streetsblog Denver’s daily headlines delivered to your inbox. Sign up for our daily e-mail digest. Hilarious! RTD just gets worse and worse! This will only prove my point. For a family of three it is always cheaper for us to Uber to the airport then the A line. We live near 5 points and go to the airport at least twice a month. Also it is cheaper for me to take a scooter down welton/downing to Welton/broadway then it is to hop on the silly worthless expensive RTD train. There is no way that anyone on the RTD board lives in a car-less home. A bunch of idiots sitting comfy in their warm cars running a joke for transportation. For multiple passengers rider sharing makes eminent sense. Your second point bolsters my belief that (over time) the suburb to city layout will make tons of sense in hindsight. How does this make RTD worse? This should lead to higher ridership, I fail to see how that is a bad thing. I’m going to call B/S on Uber being cheaper than RTD to the airport for a family of three (for a family of four absolutely). It would be $31.50 for a trip to the airport via RTD while it would be $35 or so for Uber during off-peak hours. Unless you’re using Uber Pool. As for the scooter, it’s even cheaper to rid a B-Cycle along Welton or down California. Walking is even less. Nope Paul. If we were to take the train we would Uber to train station for 10 bucks then pay the 31.50 for the train for a total 41.50. It’s a little hard lugging luggage down downing to 38th and Blake. Smarter choice to take the Uber straight there for cheaper for 30-35$. And of course walking is free, thanks for letting me know that. Hence why we don’t own a car. We walk a lot. mckillio they can’t even get their trains to work or run on time. Why are they adding another thing without perfecting the first?!? Ever been stuck on the A line for four hours with no bathroom? We have. Ever watched the time of arrival of the trains? We do. Time jumps from ten minutes away to one minute away. They are NEVER on time. Ever rode the entire A line without having your ticket checked? We have. People don’t even check tickets half the time. How can they have the time and resources for more new things when they can’t even get what they have working. You didn’t mention the you use two forms of transportation. Ride the Route 12 to 38th & Blake and the cost is cheaper, disregarding convenience. But it you want to pay more because it’s more convenient…. I ride the A Line everyday and everyday they check my fare at least once both ways. As for the other complaints, I’ve also gotten stuck in traffic due to an accident, weather, or another unforseen circumstance. The A-Line has >95% on time rate, above projected ridership, and is running 4-car trains. Seems like a lot of people are willing to accept this imperfect form of transportation. Perhaps your time and inconvenience matters little to you and that’s fine; but for many those are important considerations. Just curious. I assume you were using Masabi’s mobile app? Afaik Masabi has a good reputation. Masabi is the category creator in Mobile Ticketing and is the largest Mobile Ticket provider for public transport in the world. They’re in cities from London and Madrid to New York’s MTA, Los Angeles’ Metrolink, Boston’s MBTA, RTC (Vegas), Minneapolis etc. I wonder if RTD’s interface creates any of the issues? Admittedly this stuff like fares is beyond my comprehension. The ticketing app is fairly intuitive and follows the same selection pattern as the physical RTD kiosks. Although it isn’t a stylish UI, it’s easily navigable. I’m quite surprised that you had such a difficult time with it. I use RTD’s myride reloadable card, but if get caught without it or run out of funds, then I use the ticketing app. I’m able to select and checkout in literally 10-15 seconds as the app interfaces with Apple Pay. I came across this post while searching for some additional insight into Uber’s future plans for integrating public transit and Uber pool, ie mixed trips booked with a single payment where an Uber pool is positioned to pickup multiple coriders the moment they arrive at their last transit stop or efficiently drops a pool of riders at a transit station. Instead I found nonsensical and uninformed whining. Clearly RTD doesn’t think their app is any good, either. Why would they give Uber that ability without having the reciprocal ability in their own app? Acquiring users to an app is hard, and if you’re committed to find programs that add value to your own app, OR you give it to someone like Uber who are clearly experts not only with app design and usage but also services. Let’s see Transit Agencies (with decent apps which likely means you leave the US) start driving multi-modal options from their own services. But as a visitor this pretty awesome. No one wants to visit a city and have to download that city’s transit app, learn how to use it just so they can uninstall it later. I really don’t see a downside to this, I just wish Lyft would do it too since I don’t use Uber. And now that I think about it, this could perhaps encourage those who aren’t as easily drawn to RTD to at least consider it as an option with Uber providing (first/last mile ride) convenience to the train station. Agree re: visitor but transit agencies need to deliver value to their core users, and best they ‘own’ the relationship. How come RTD hasn’t shut down yet? What could go wrong? Well, regular transit usage may decline even further? The goal here should be Uber adopting higher capacity vehicles like vans and micro-buses. 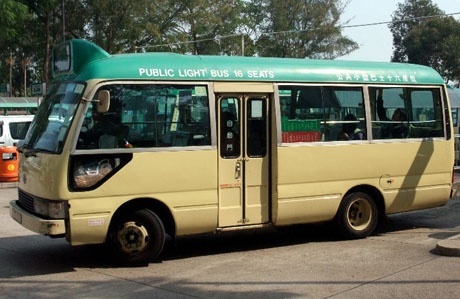 Before you decry mini buses, Hong Kong, one of the densest, BIGGEST City in the world uses them. For Denver, a tiny city of no more than 700,000 this should be plenty. The real argument should be that transit should be privatized or at least allow private competitors. Streetsblog just published an article saying transit in Denver serves few, because transit is routed where politicians tell them because they control the money. Instead Denver spent billions on useless lightrail projects. travel by personal cars account for 86%. If more private drivers simply carpooled more, congestion would go down. Millennial gentrification is a thing in many cities including Denver, Portland etc. Portland did the analysis and the smart-phone generation doesn’t like riding Big Bertha buses. Guess what I’ve been arguing for? I’ve said it before the downside to transit it only goes where it’s been routed, a single artery that only transports from a-b and having just one artery is not a healthy organism. That method only works in linear fashion in linear cities. New York, Hong Kong, both of which are rectangles in essence. Transit as they propose is monolithic, built to a specific size, specific scale, specific timeframe. Where as the automobile and the street grid are a cellular organism. Look up Dr. John von Neumann and his study of cellular automata; in comparative biology. A multicellular organism does not thrive on a fixed number of cells, instead it responds to stimuli by producing more cells to accommodate a need. The city is the organism, the cells are cars, personal demand, cargo, parcels, freight, etc is the nutrients/stimuli. When the system encounters an influent, it produces more cells (cars) to accommodate the stimuli (people needing to move, packages) or produces special cells (mutli person vehicles like vans or small buses) to accommodate specific circumstance. In nature all stimuli are confronted with the production of cells. If there’s more sunlight, more photosynthetic cells are produced, if there’s a surge in water, more water storage cells are produced. The era of Big Government infrastructure IS OVER. It incurs too much debt, invites too much political corruption and is at the mercy and hostage to an ever changing stream of politicians too stupid to put together a two piece puzzle. And the Money for it doesn’t exist. IT’S GONE……..Down a financial Black Hole and IT AINT COMING BACK. We’re gonna have to Make New Arrangements. For the most part I assume most people know where they want to go and how to get there; the only question is whether they drive or not. I’d love to try Uber but my iPhone (is old and) does not support the app. It’ll be a while before I spend money on a new(er) phone, so for now I’ll be downloading the app for the transit company. For locating RTD buses, I have web pages bookmarked for the routes I am interested in. 📱 RTD’s ticketing app is by Masabi, Muni Metro’s was made by Moovel (formerly known as Globe Sherpa). They pin on realtime predictions from elsewhere. From what I’ve read, Uber is using a Masabi SDK to connect data to their app.